Summary: In a follow-up to last year’s Kate Warne: Pinkerton Detective, Marissa Moss traces the history of Allan Pinkerton, the man who founded the Pinkerton Detective Agency. Born in poverty in Scotland, Pinkerton had a good memory, sharp eyes, and a thirst for justice that got him into trouble with the British government. He and his bride fled to America on their wedding day to escape his arrest. In Chicago, he started a business making barrels, until he almost accidentally solved a counterfeiting case while collecting wood on an island. He worked with the Chicago police for awhile, then started his own private investigation firm. Much of the book is about his most famous case, outwitting secessionists who planned to assassinate Abraham Lincoln as he traveled by train from Springfield, Illinois to Washington, D.C. It was a complicated operation that required disguises, codes, and moving Lincoln’s railroad car through the streets of Chicago in the middle of the night. Lincoln rewarded Pinkerton by appointing him to run the newly-formed Secret Service, an organization that exists to this day, as does PInkerton’s detective agency. Includes a timeline, author’s and illustrator’s notes, a bibliography, and a brief index. 48 pages; grades 3-6. Pros: Who doesn’t love a good spy story? Or a rags-to-riches tale? 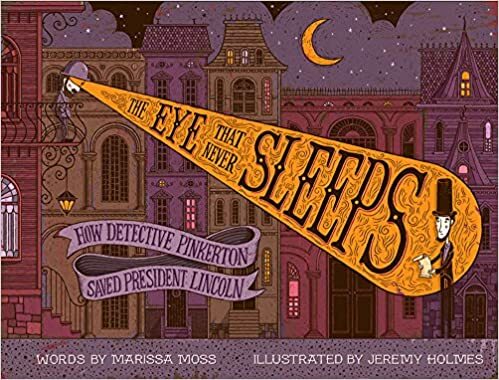 Allan Pinkerton’s life provides both; Marissa Moss’s narrative and Jeremy Holmes’ unique illustrations will have readers turning the pages to see how Abraham Lincoln got safely to the White House. Cons: While the illustrations are very cool (they’re done on digital scratchboard and include vintage typography–read the artist’s note for more details, because, honestly, I don’t really know what that means), some of them could be a little confusing to younger readers.